This time last year I was looking ahead to my second full year of working for the Angling Trust and predicted that much time and energy would be expended on the battles over cormorant predation, hydropower and the Severn Barrage, canoe trespass, declining marine stocks, over abstraction of chalk streams and trying to improve the government’s draft water bill which was threatening to make a bad situation even worse. On the personal fishing front I was aiming to bag my first ever bonefish and my first Giant Trevally on the fly on a trip to the Seychelles. Closer to home the targets were another Scottish salmon, a big Irish bass, a five pound grey mullet, some more two pound roach and to finally crack that double figure tench. Nothing too ambitious then! I’ve always liked to have targets, dreams and ambitions – they keep me positive and ensure that the childlike enthusiasm that infects us lifelong anglers remains alive. I left frontline politics behind me in 2010 so that I could travel the world, pursue some of these dreams and devote myself to campaigning about the things that matter most to me. I can honestly say that I’ve never had a moment’s regret from the day I retired from the House of Commons and threw myself into this new fishing life. One of the joys of now working as a freelancer is that I can make time to do the things that I never could when I was tied either to a career or a constituency. With Christmas and the New Year celebrations just days away now is perhaps a good time to look back on the past twelve months and see how things turned out. Like all good anglers I’m going to start by blaming the weather. Ten years ago the Climate Change scientists predicted a marked increase in extreme weather patterns and they weren’t wrong. We spent much of 2012 worrying about a record drought. Then came the record summer rains, and then the winter rains, and then an unseasonally cold and dry spring followed by a summer heatwave – at which point the fish lost all sense of time and place to the extent that the Wye barbel were still secreting milt in July and the tench in some lakes were carrying spawn as late as August. With the salmon rivers reduced to a trickle and the surf all but absent from the Irish coastline I could see that some of my fishing targets might be a little challenging to say the least. Big Thames Valley tench were in short supply thanks to the cold Spring but a good sprinkling of six and seven pounders kept a smile on my face in the early part of the year. 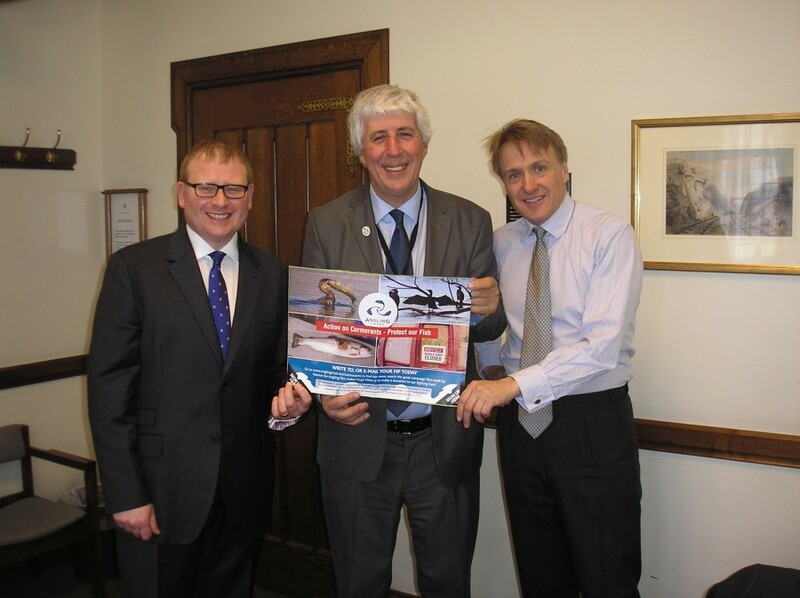 It was however, a very good year for the Angling Trust. Our membership grew and both our funding and influence increased substantially. January saw me back in the ‘old place’ giving evidence to a Commons Select Committee on why the proposed Severn Barrage would be a disaster for both the Bristol Channel and the migratory fish runs on the Severn, Wye and Usk. In February we courted controversy with our attempts to prevent ‘Keith’ the seal from munching his way through the freshwater fish stocks of the Severn and Teme and with the publication of our ‘Dossier of Destruction’ on the impacts of unsustainable cormorant predation. In March we highlighted the disgraceful online Rod Licence Rip Off whereby cowboy companies were charging a 30% fee to unsuspecting anglers. This was a direct consequence of a stupid ban on marketing that the government imposed on the Environment Agency which we’ve now got lifted. 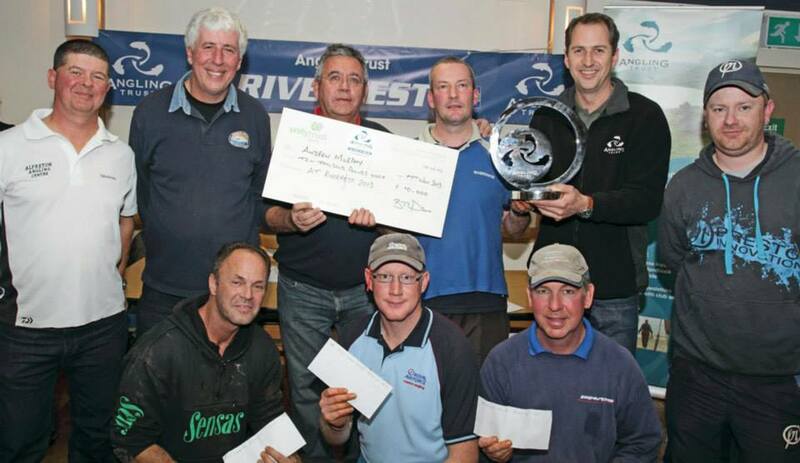 April saw us launch Dave Harrell’s RiverFest competition which aimed to get competitive angling back on natural venues and offered the largest ever prize, £10,000, for a river match in the UK. 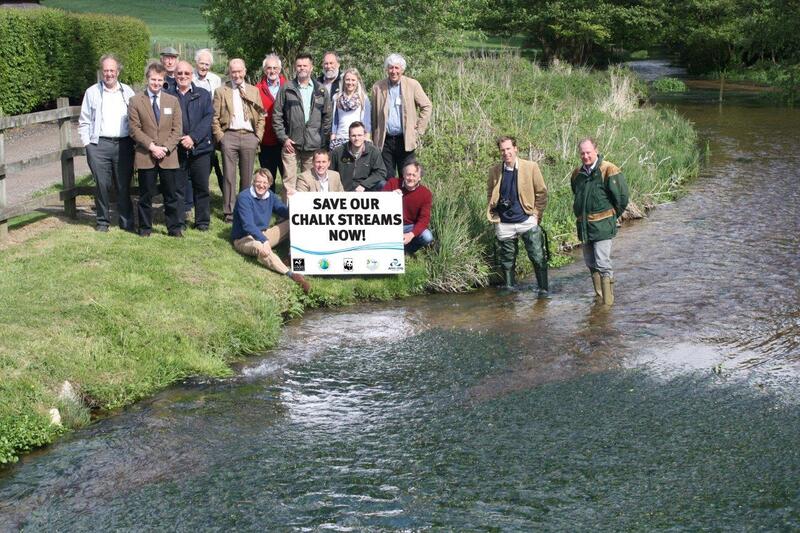 In May the Angling Trust partnered up with the Salmon and Trout Association, WWF and the Wildlife Trusts to launch the Charter for Chalk Streams which proposed an action plan to halt the decline of these iconic environmental assets, 85% of which are situated here in England. We celebrated the halfway point of the year with the news that the government looked set to throw out the Severn Barrage plans in favour of more environmental and fish friendly solutions to harness the tidal power of this great estuary. The Angling Trust’s Charter for Chalk Streams hit the national headlines this year and framed the discussions around the government’s water bill. Things were less successful on the home fishing front. I came nowhere near repeating that stunning brace of two pound Hampshire Avon roach which was the undoubted highlight of the previous year. 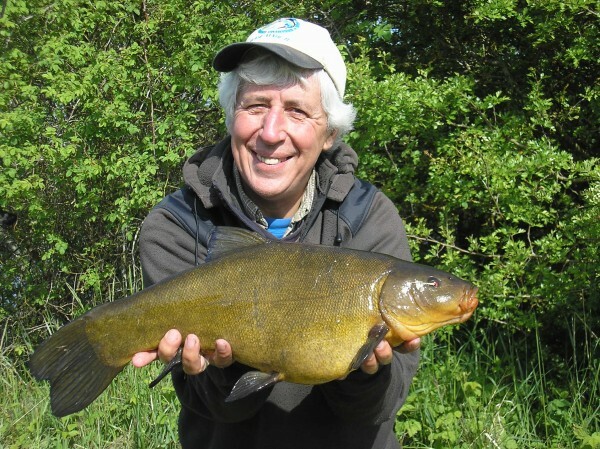 The tench were slow to wake up and after five consecutive blanks at my specimen Thames Valley gravel pit I migrated towards some easier venues which saw me land plenty of tincas but none over eight pounds. The salmon fishing trip up North was good for a suntan and not much else and likewise the Irish bass although I did nail a reasonable fish at night. The mullet were more obliging and I did have a decent bass session in the Solent which included a surprise personal best 4.5lbs wrasse. 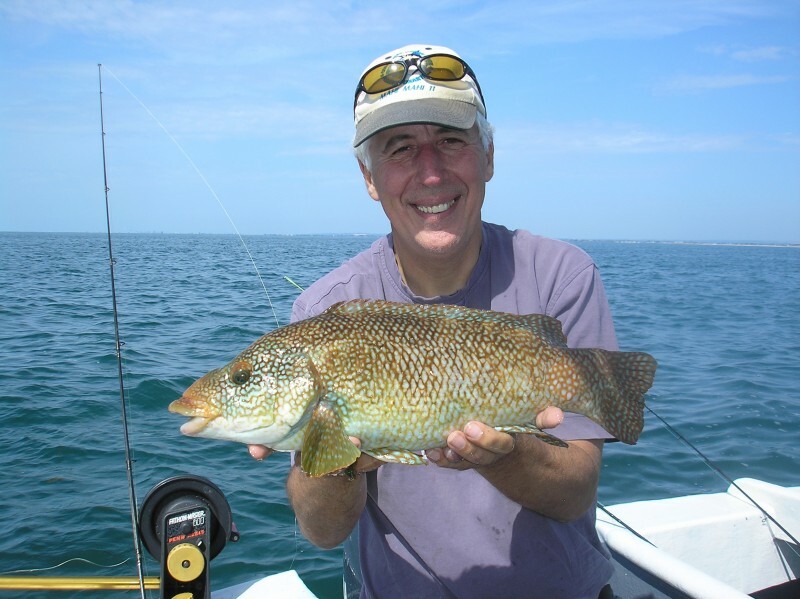 My best wrasse by some way even if it was caught accidentally while bass fishing! Even without casting a line the trip to the Alphonse Island in the Seychelles was going to be awesome but those screaming bonefish runs and the brutal power of a GT on a fly rod have burnished images into my brain that will never fade. My wife had a special birthday coming up in March and we still had a few savings left in our Australian bank account so a trip back to see our friends in Sydney and a return to the paradise that is Lord Howe Island seemed the best way to mark the occasion. 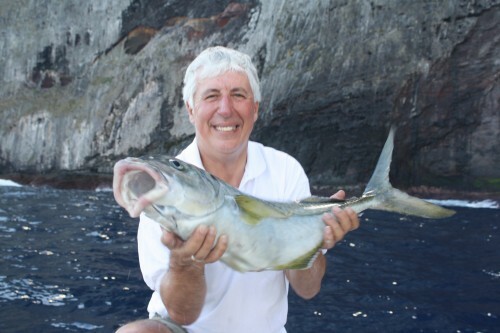 As ever the fishing was outstanding and this time I was able to realise a long held ambition to fish around Ball’s Pyramid – the tallest ocean stack in the world. For once the famous kingfish of Lord Howe were nowhere to be seen but some crazy silver trevally more than made up for it. These brutes absolutely annihilate any weak point in the tackle and although our 30lb outfits could tame the smaller fish up to around ten kilos far too many bigger specimens made it down to the reef below. 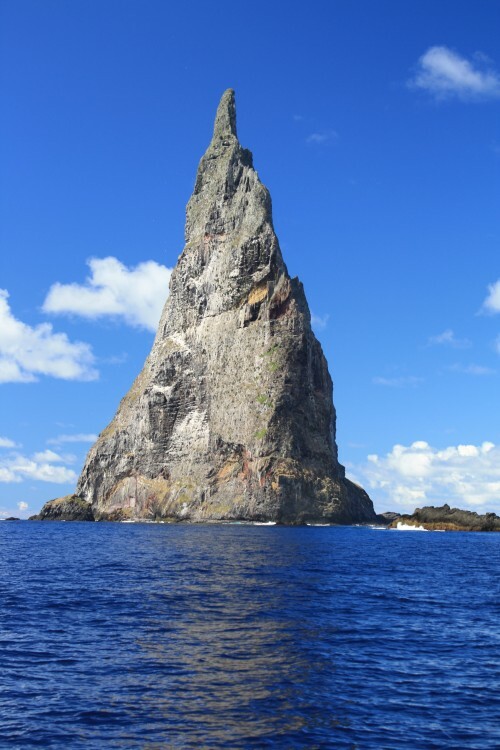 The impressive Ball’s Pyramid, the largest ‘ocean stack’ in the world and home to some serious fishes ! 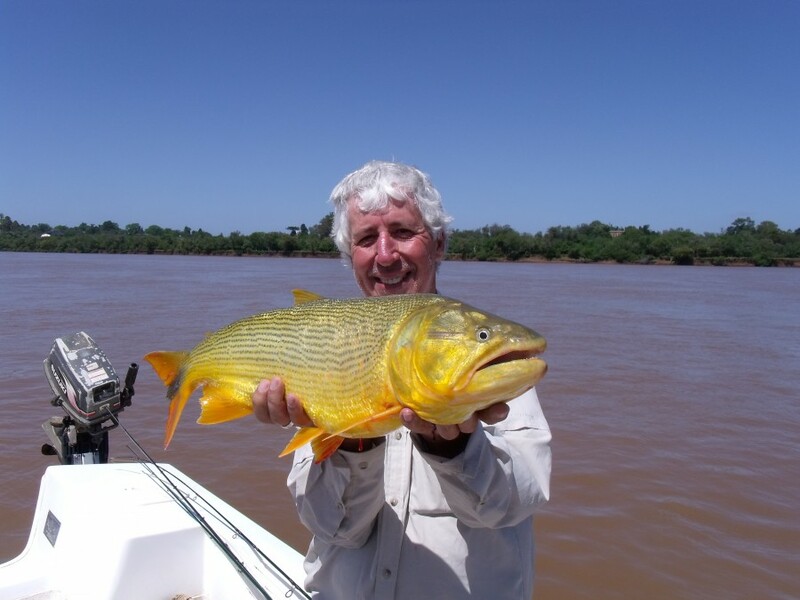 I thought that was going to be it for foreign travel but later on in the year I was lucky enough to be invited by Classic Angling editor to take up a spare place on a long planned trip to the Uruguay River after the beautiful golden dorado. Despite 5 metres of filthy floodwater the fish obliged and several stunning bars of fishy gold were added to my personal bucket list. It was at the Game Fair in July that soon to be departed Fisheries Minister Richard Benyon made his announcement on a new scheme to allow for better controls on cormorants and goosanders and the following month saw us again working with Benyon to try and restrict the sale of the deadly pesticide Chlorpyrifos which caused a 15 kms wipe out of invertebrates on the upper Kennet. In September we weighed into the fracking controversy with a warning that the environmental protections were too weak to adequately protect rivers and groundwater supplies. This was after consultation with our colleagues in Trout Unlimited who have been fighting the frackers for years in the US. Whilst the water bill arguments are still on-going the year ended with a flurry of activity including a trip to Lisbon to speak at the Pure Fishing workshop on conservation, the launch of our evidence dossier on organised canoe trespass, the publication of Sea Angling 2012 which estimated the economic value of recreational sea fishing to be close to £2 billion per annum, confirmation from new Fisheries Minister George Eustice that Benyon’s bass minimum landing size review was still alive and the start of an exciting project to promote and protect crucian carp fisheries. As it happens in my ‘spare’ time I chair a charity in Reading that provides enrichment activities for kids from challenging backgrounds. This has included a big fundraising drive to build an outdoor education centre at Ufton on the outskirts of Reading. 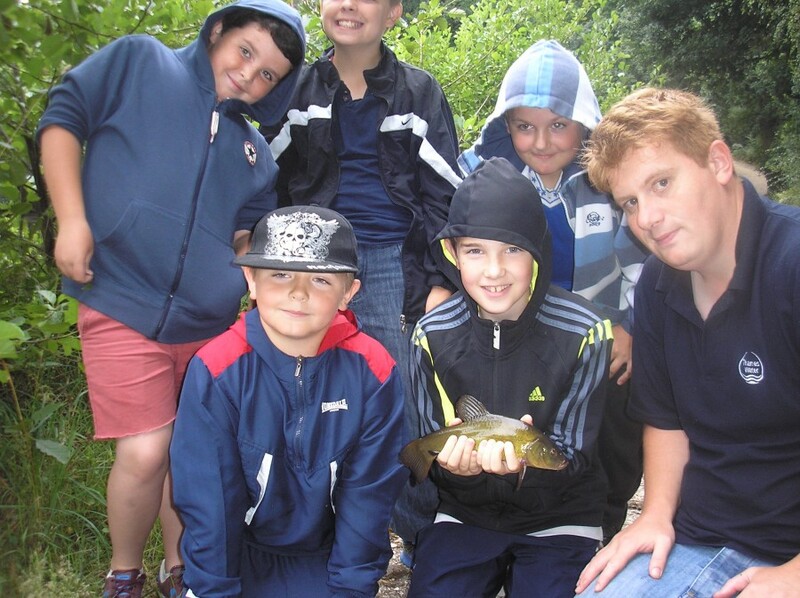 And of course fishing is outdoor education, at least it should be, so we have developed one of the ponds on the estate into a fishery for youngsters staying at the camp. The small tench we stocked two years ago are now of a catchable size and this winter we’ve added a healthy sprinkling of crucian carp. 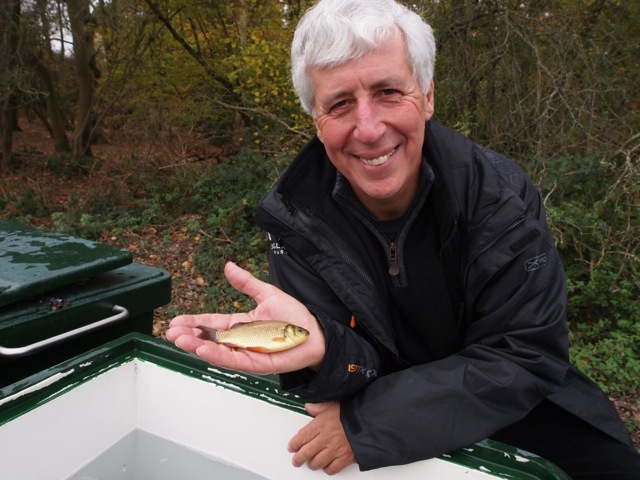 I’m a huge fan of these quintessential English fish and I’m looking forward to playing my part in teaching young people to fish the proper way – with a float ! Crucian carp, the fish of the future, if I have my way! Perhaps one of the real highlights for me in my Angling Trust role was the successful RiverFest final on the wonderful Wye at Hereford. The river was in perfect nick and fining down nicely after rain the week before. It was great to see our highly skilled finalists practising their art on a fish filled river with some great catches of roach, dace, chub and barbel all earning serious prize money for the lucky winners. The prize giving was a sea of happy faces as the video here shows and it really was something to see competitive angling returning to the rivers. One of my targets for next year is to help Dave Harrell secure some significant sponsorship for RiverFest so that it can become a regular event in the angling calendar. As for plans and predictions for 2014 ? Well I intend to celebrate my 60th birthday with a tarpon from Cuba and a big tench from the Cotswold Water Park. I’m going to try for a big chub and a barbel from my local River Loddon and I’m determined to bag a decent bass before the netsmen crash the fishery. On the work front I’m looking forward to the start of the Thames Tunnel to finally clean up the tidal river in London and I’m confident the Angling Trust will go from strength to strength as the body that fights effectively for fish and fishing. Isn’t it about time you made it a New Year’s resolution to join us?